A 42-year-old food vendor who left her country, Republic of Togo in search of a better living condition in Lagos, has been arrested following the death of a man she alleged was killed by her husband. The lady who found herself entangled in a relationship that produced three children, alleged that she fell out with the man and buried herself in her business as a food vendor in Apapa area of Lagos state. However along the line, she met another man, Idris, a hustler at the Apapa port, with whom she has two children. The lady is currently being held at the State Criminal Investigation and Intelligence Department, SCIID, Yaba, Lagos, over alleged murder of one Abdulraman Danbaba (32), a Togolese, who was allegedly hacked to death by Adisa’s husband , Idris. 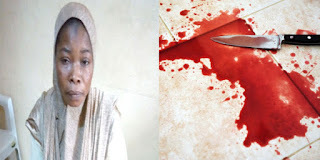 The deceased was killed by at the couple’s apartment, a shanti , on Kofo Abayomi round about , Apapa, last Friday, after Idris alleged that Abdulraman Danbaba was having clandestine relationship with his wife. Idris who found Danbaba in a compromising position with his wife after he returned home by 10pm, looked for a hammer which he landed on the visitor, causing him to slump. He fled the scene after the incident. “Danbaba was a regular customer of mine. He usually visited my buka to buy food. He became our family friend when I discovered we were from same country. My husband even knew him because he (deceased) usually visited when my husband was around. Last Friday, I called Danbaba on the phone to buy me beans porridge because I had not finished cooking and I was very hungry. That was not the first time he would buy food for me. “ When he came, he met me in the sitting room but said that he did not buy the beans. He sat down to watch the television with me. Besides I was not alone with him. My employees and children were also in the sitting room. “ Barely had he stayed for 15 minutes than my husband returned. Immediately he sighted Danbaba and I together, he went out. Not quite long , he came in again. He went straight to where Danbaba sat and landed a hammer on his head. I never knew he was armed , I would have prevented him from striking. He immediately bolted away when he realised what he had done. We poured water on Danbaba as we kept calling his name but he did not respond.By the time we rushed him to the Apapa general Hospital, we were told he was dead. “ Now my husband has abandoned me to suffer for a crime I did not commit. How could he have accused me of having extra marital affairs with the deceased whom I was much older than? How could I be promiscuous at this age, when I have better things to think about? I am diabetic and that is the most pressing issue on my mind , not promiscuity. “ I really don’t know where he fled to. He could have gone to his country because he knows I know there. I wish he would come back to face the consequences of his crime instead of leaving me to face it”. Vanguard reported that efforts were still on by Homicide detectives to apprehend the fleeing suspect. In the meantime, his wife as reliably gathered, would be charged to court .